All About Therapy, PLLC is locally owned and operated in the Raleigh, Durham and Chapel Hill areas in North Carolina. We are looking for occupational therapists who already live in the area or those who are looking to relocate here. We are dedicated to improving the lives of children by building trusting partnerships with parents and firm foundations for children. Join our team and become a part of this rewarding experience! We are currently seeking occupational therapists to provide early intervention services (birth to 3) as well as some school-aged children in their natural setting. These settings include homes, daycare and preschools. Full and part time contract positions are available. You will be paid generously on a per visit basis and bonuses are available. This is perfect for someone who is looking for a flexible schedule as you make your own hours! We will partner with you to ensure we are building your caseload and career in the direction you would like them to go. Are you already seeing kids in the area but would like to increase your caseload? Great! Contact us and we can discuss ways to increase your caseload. Why Choose All About Therapy? Come meet us today! Positions are available in Raleigh, Durham, Chapel Hill and the surrounding areas in North Carolina. 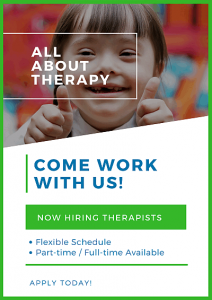 Send resumes to careers@allabouttherapyforkids.com or call (919) 448-6018. You may upload your resume and cover letter. Please use Word or Pdf format.